published in Leipzig by Hofmeister in 1834. Reproduced from the University of Chicago Library, with permission. The portrait is from an oil by Pierre Vigneron, 1833. To hide Frontispiece, click portrait. 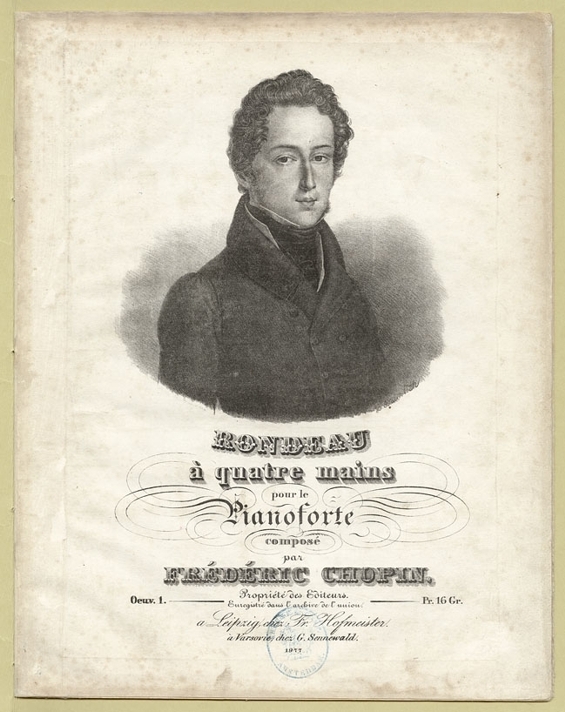 The subject of this Chopin Online Catalog web site is a collection of scores of early printed editions of music works by the composer Frédéric Chopin (1810–1849). The collection is located in the University of Chicago Library. It is referred to here as the Chopin Collection. Its scope is 85 of Chopin’s works published before 1881, of which 74 are works with opus number and 11 are a selection of works without opus number. It includes first and other early editions of individual scores, and a selection of early collective editions. The purpose of Chopin Online Catalog is to provide descriptive bibliographic information about each of the individual scores in the collection and about each of the collected editions. The online catalog was created in 2006 as a revised and augmented digital version of a Chopin print catalog. Links to its nine sections are given in the navigation frame above. The Register of scores section is the catalog’s main bibliographic feature. It consists of a single annotated list of all of the collection’s individual works and scores, with links to the scores’ bibliographic descriptions. The Register is also used to create Other views of the Collection, namely a view by genre, a view by bibliographic category, and a view by dedication. For recent additions and changes to the catalog, please refer to Recent Site Updates. For non-commercial educational or scholarly purposes, the information at this site may be used without explicit permission. For such use please include an acknowledgment to the Chopin Online Catalog. All other uses require explicit permission. Please apply to gwp@gwpstudies.net. Extensive assistance in preparing the Chopin Online Catalog was provided by Alice Schreyer, Director of the Special Collections Research Center at the University of Chicago Library, and by staff of the Center. Other Library staff also contributed; in particular Kathleen Arthur, Preservation Librarian; Charles Blair and Elisabeth Long, co-Directors of the Digital Library Development Center; and Scott Landvatter, Bibliographer for Music. Copyright © 2006-2008 George W. Platzman. All rights reserved.